NEWINGTON - Fourteen years after he was tragically killed in the line of duty, Newington Master Police Officer Sgt. Peter Lavery’s legacy lives on through the efforts of family, friends and fellow officers. The 14th annual MPO Peter Lavery Memorial Run is set for next Sunday, Sept. 16. The motorcycle ride begins in Newington’s Churchill Park and runs through eight towns. Riders can register between 8 and 9:45 a.m. before departing at 10 a.m. A $20 donation per bike is requested. The route heads through Berlin, Rocky Hill, Cromwell, Middletown, Portland, Glastonbury and Wethersfield before circling back into Newington. 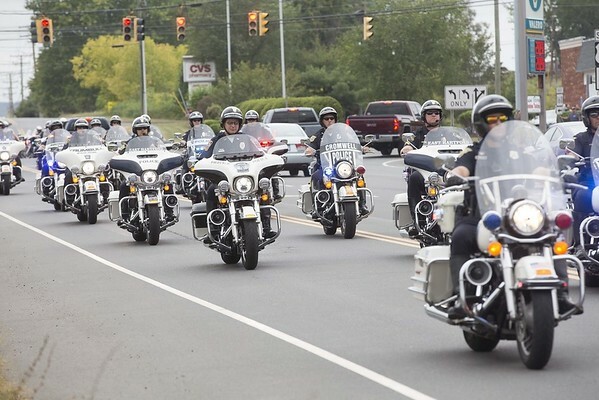 It is one of the only police-escorted rides of its kind, according to Peter’s widow, Pamela Lavery. Her husband was a motor officer and worked for the town of Newington for 16 years. He loved taking part in organized motorcycle rides and the couple also enjoyed riding together. Peter was killed on Dec. 30, 2004 following a 12-hour standoff at a home on Mountain View Drive, where he had responded to a domestic violence incident. The Peter J. Lavery Memorial Scholarship Fund was established to honor his legacy. The fund awards scholarships each year to several local students who are pursuing careers in law enforcement. At least $140,000 in scholarships has been awarded to date. The children of retired Newington police Sgt. Jeanine Allin are among those who benefited from this award. Allin was a close friend of the Lavery family and worked with Peter for 14 years. Allin volunteers at the ride every year, registering participants as they come into the park. Lots of volunteers make the ride a success, from the motor officer escorts to people who cook lunch when riders return and those who clean up the park afterwards. Fire departments in each of the towns on the route have taken on their own tradition the day of the event. As riders head by their stations, they are greeted by giant American flags flying from fire apparatuses in Peter’s honor. The event will be held in rain or shine. 14th Annual Peter Lavery Memorial Ride T-shirts are being sold in advance at Connecticut Police Supply on Fenn Road and Gengras Harley-Davidson on Governor St. in East Hartford. WHEN: Sunday, Sept. 16 at 10 a.m.
Posted in New Britain Herald, New Britain, Newington on Monday, 10 September 2018 21:04. Updated: Monday, 10 September 2018 21:06.